Compact, elegant and full of smart technology, the inductive charger recharges Charge&Go and Cellion primax hearing aids. After a full charge, the hearing aids deliver 24 hours of outstanding hearing with unlimited streaming, even with a high-power RIC receiver. • Inductive charging - The hearing aid simply lies in the cradle and automatically starts charging. • Light and compact - Lightweight construction makes the charger ultra-portable. • Fast charging- Only four hours for a full charge. A 30 min. charge provides seven hours of use. • Gently dehumidifies during the charging cycle. The Siemens Charge&Go and Cellion Inductive Charger is a sleek and elegant recharger, packed with technology, for Charge&Go and Cellion primax hearing aids. After a full charge, the hearing aids deliver 24 hours of continuous outstanding hearing with unlimited Bluetooth streaming. The LED indicators clearly display the status of both hearing aid power cells. During the charging cycles, the charger even dehumidifies the hearing aids for better care and longer service life. The Cellion charger is compatible with a wide range of flexible and inexpensive power packs that connect via the micro USB standard used by many mobile devices. 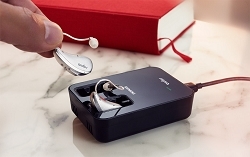 Only compatible with Siemens Signia Charge&Go and Cellion hearing aids.